It’s 2021. The U.S. has become a near-military state, and drones are present in nearly every aspect of life. Assassinations of prominent Americans are common, interstate travel is ruthlessly restricted, explosions rock cities daily and, worst of all, food is increasingly controlled by a corrupt syndicate of rival militias, keeping the country on the brink of starvation. After receiving a cryptic message from his father urging him to evacuate his girlfriend, Raine, 19-year-old Matt Carney embarks on a cross-country road trip to California. Between a series of attempted hits by political party thugs, the endless interference of local police, and homeland security Predator drones endlessly raining down missiles on private citizens, however, Matt faces more deadly obstacles than he ever imagined possible. And here he thought Raine was the only one in mortal danger. As he attempts to stay alive during his journey westward, Matt is joined by his stepbrother Benjy, and together they learn that their father is a leader of the terrorist group March22, a fact that does little to comfort Matt as he simply tries to survive the myriad attacks on him from the government, local law enforcement, and terrorist groups. As they travel further across the country, Matt and Benjy learn how March22 intends to fight back against the epidemic of corruption and violence that now festers in the U.S. government—a fight that might change the face of the country forever. Can two ordinary boys in a blue Ford pickup outrun missiles launched from Predator drones? Can March22 outsmart homeland security and the U.S. government to help Matt accomplish his mission? And, most of all—can Matt and Benjy arrive in time to save Raine? http://Naznin.booklikes.com Naznin Azeez's blog! 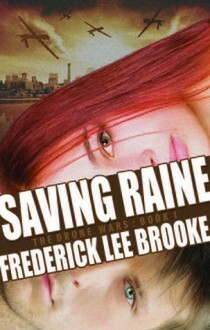 5.0 Book Review : Saving Raine by Frederick Lee Brooke! url Book Review : Saving Raine by Frederick Lee Brooke!